Recently, I’ve made a couple of changes in what I cook for my family. I’m feeling good about serving better food and enjoying my return to a long-dormant hobby. But these changes have had a cascade effect: cooking new things means I’m using different equipment, so I’ve had to rethink how I organize my kitchen. The changes I made weren’t big, but they’re a good reminder that organizing is a process, and that organizing systems are not static. If you’ve been reading the blog for a while, you might remember that Aby wrote a comprehensive post about the phases of organizing: the original organizing (purging, sorting, and re-storing), then the process of creating the habits needed to use the new system, and finally maintenance and adjustment. She used clothes and papers as examples. But back to my kitchen, and my own phase-three adjustments. Till recently, I’d been happy with how my kitchen was arranged. But then I started making more homemade foods so I can better control the ingredients my family eats. I’m making my own salad dressings, for instance, and tomato sauce. And I’m (mostly) making the cookies we all love to eat. Preparing all those batches of cookies had a surprising effect: it rekindled my love of baking. I had once been an avid, serious baker, but a few years ago I got tired of it. Recently, though, I found myself longing to bake bread again, in addition to our sweets. These days, I’m happily baking a lot. With my new cooking habits, I found myself reaching for tools I’d used infrequently in the past. For instance, I like to use an immersion blender to make my tomato sauce smoother. And after years of relying on my big stand mixer exclusively, I’m finding my handheld mixer more convenient for many smaller tasks. Both items were in a bin on a high shelf. It didn’t take long for me to get tired of standing on a kitchen chair to reach them. I didn’t have an obvious spot to move these items. So I examined a bin on a lower, easy-to-reach shelf. It was designed to hold items I used frequently—that’s why I gave it such a good location—but I realized I had stopped using some of those items much. Bingo! Time for a switcheroo: I moved most of those things to the high shelf and put the mixer and blender in their place. And one item I didn’t switch at all. I had completely forgotten about a lemon juicer I had, because I now use a different tool. So it went out of my kitchen and into my donation bin. I followed a similar process in the cabinet where I kept my baking pans. I had bought a new item (a popover pan) and moved another one up from the basement (a ceramic loaf pan). But—you guessed it—they didn’t fit into the cabinet. In this case, I was able to rearrange all the equipment in a way to keep it together. Now I’ll be the first to admit that these were not dramatic changes. And it’s true, I could have continued to climb on a chair to reach my blender and mixer, or walk down to my basement for the baking pans. But I’m glad I took the time to adjust how I stored these items, because it will make my cooking easier and more efficient. I also know that over time, if I don’t make these kinds of periodic adjustments, I could wind up with a seriously disorganized space, rather than one that is just inconvenient or annoying to use. 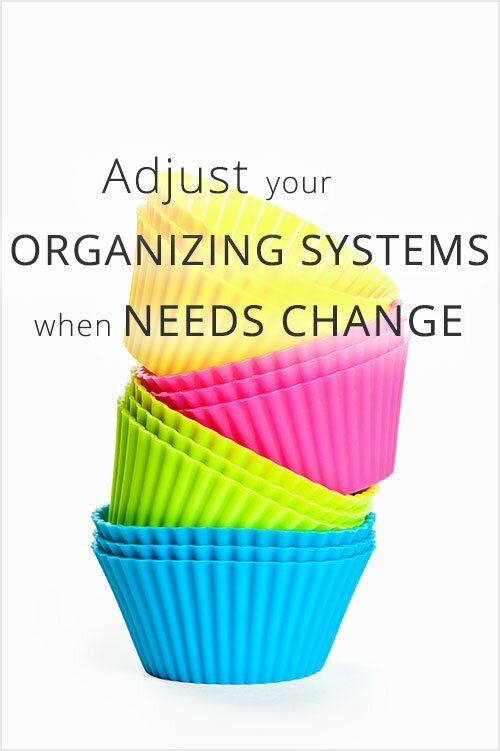 Have you tweaked any organization systems to accommodate changes in your habits? I think this is why I feel like I am always organizing. It is not that the system was a failure, but that needs and habits change. In my family of growing children, there is constant change. My last child can finally reach the plates and glasses in the cabinet – no need to store any down low for him equals more lower cabinet space for me! My garage is the same way, it is constantly changing as interest in different sports and activities change and as children grow and can reach higher or become more responsible for storing their own equipment. I’m not sure I would know how to behave if I didn’t have something to organize or a system to tweak! I think your 2nd sentence says it all…Needing to change a system doesn’t have to mean the system had a problem. I think you are very wise to make these adjustments as your family grows. No recent changes really but every time I do laundry I am reminded of how us moving into this house 7 years ago created the need to rethink some items. Here in the Netherlands we don’t have a real laundry room. In the previous house I had a square closet built, washer dryer stacked but still enough space for a rod to hang clothes waiting for ironing, the iron and ironing board as well as the hamper. All those extras don’t fit in our current closet. We had to get a different decorative hamper in plain view in the bathroom. Iron and ironing board found a place in a bedroom closet. I also switched around the contents of a storage basket on top of the stacked appliances. One holds detergents etc. The 2nd one used to hold ironing supplies – close to ironing board. Those are now with the board in the bedroom closet. Now it holds cleaning supplies that used to be in an undersink cabinet before. With the current bathroom having no cabinetry at all, those cleaning supplies now live in that basket. Out of sight yet easilpy accessible. Sounds like you found changes that work for you. Moving is certainly a good reason to rethink how you store things! And maybe to rethink them more than once…I know that after I had been in my new house for a few weeks or months, it was clear that some of my first attempts hadn’t quite hit the mark, so I tried a second time and got my new systems right. Some of those systems are still in place, but of course I’ve had to do more changes over the years to others….